Apart from the album that I've uploaded, this is the last of the photos that I'll post from our visit to The Giraffe House. Boa Constrictors aren't native to Africa, but I thought that I'd post this photo because the snake show/educational was so interesting. 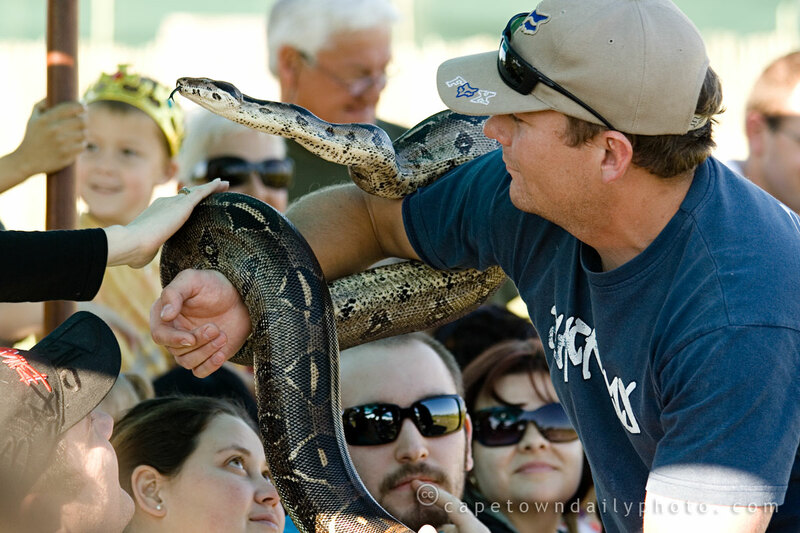 I'm not a parent, but what was nice was that the snake handler in the photo engaged with and invited kids forward to touch and hold snakes - yup, even this large Boa Constrictor. "Red touching black - poison lack; red touching yellow will kill a fellow." EDIT: Please see my the comment below which corrects what I understood the handler was meant by red/black and red/yellow. Posted in Activities and tagged animals, leisure on Wednesday, 29 July, 2009 by Paul. Oh dear snakes and me don’t go together so I may well be taking this place off my list of places to visit :) but I must say well done with getting the photo if it had been me the snake and people would have only been specks in the distance..
Bjorn, the snake handler in the photo, was kind enough to correct what I understood the little rhyme. You miss understood me on the snake’s colouring. It’s red touching black venom lack and red touching yellow will kill a fellow. This is only to tell the difference between the Coral snakes which are venomous and the harmless King and Milksnakes that mimic the colours. The rhyme doesn’t work for all snakes. Sometimes there are misunderstandings and I could explain myself better. Just though I would let you know. Thanks Bjorn for pointing this out!